Made to compliment your Galaxy Note 9 perfectly, this official replacement Stylus in blue from Samsung allows you to get down to business with precise control and accuracy. Does its job but doesnt feel the same as the original. Very helpful with good communications as pay pal did not seem to have my house number in my address. Does it work on Samsung 9 phone as well as note9 . I replaced my stylus for my note 9 after losing my original one. I looked everywhere for a new replacement, and they were really expensive before coming across mobile fun, my only option would have been eBay replacement that was not Bluetooth enabled or Samsung authentic. I only wish that the shipping was a little bit faster. I can't really blame the company for this though. A little slow to receive but works perfect and love that it is yellow so that I am more likely to notice if it drops out. I lost the stylus that came with my Note 9. They were not available from Samsung, so I searched the web for one. I came across Mobilfun.com that had good ratings and comments. It shipped from Europe so it took a little longer to arrive than things ordered from the US, but that was no problem. When i received it, it performed exactly like the original stylus. If I lose this one, I won't hesitate to order from them again! The product was exactly like the original. Cant remember if it said it needed to be programmed, but once I put the pen in it connected with my phone immediately. Wanted to make sure I am getting the original Samsung S Pen. The product itself was as expected however the delivery was more than a week late. The stylus is completely and truly OEM, charges and syncs automatically, takes pics with bluetooth, and has the same awesome clicky feel as the one I lost. Its perfect just what l needed, it's just like the original before I lost it. Just like the original stylus, fits and works perfectly. Couldn't be happier. Would recommend if you broke or lost your official Samsung stylus. Great price as well, so I am extremely pleased. Thank you it works as its suppose to Thank You again. Bluetooth works like it should. Bought a replacement from Amazon, wouldn't sync with my phone. Bought this one and no issues, very happy. The replacement pen was just like the original pen purchased with the phone. Very easy to pair is to the phone to access its bluetooth features. My husband is whole again. Works just like my original one that came with my phone no issues and received it within a week. Very satisfied. I like the product...it works and compatible with my phone..thank you..
Amazing official Samsung Pen! Much cheaper than anywhere else!! Only complaint is it took several weeks to arrive to Canada. Broke my original needed a replacement. This is like it was never gone. It is Bluetooth enabled and works exactly like the original that came with my Galaxy Note 9. The information provided was good..went on YouTube where it was evaluated by a blogger who gave it an excellent review. The spen works great and comes with extra tips. I am very happy with the product and your service. I received the right product before schedule. Appreciate your help. I just recieved my stylus for my note 9 after waiting 8 crucial days. I order this one because my son lost mine. I found mine 2 days before this came in, so bonus to me. I was sceptical ordering from this site. Never heard of it before and thought it was a little sketchy. I figure if it has bluetooth why not. A stylus with bluetooth is $50+ anywhere else. So I placed my order. ??? ?I found it hard to believe because it was that cheap and soo many great reviews. I thought it would be shipped from US but instead it was UK and NO TRACKING NUMBER. You have to pay for tracking. Got the stylus and I LOVE IT!!! Not only does it have bluetooth but also a serial number and compared to my original no difference. The features are all the same the writing is excellent and I cant find anything wrong with it. TIP: When you want to connect the replacement stylus to your phone do the following steps. For anyone in the US my order was shipped from overseas so there is no tracking number and it takes approx. 10 days or 2 weeks to arrive. However everything was perfect on arrival. I needed a new Samsung Galaxy Note 9 pen since I'm either breaking or losing mine. The problem is everywhere you go they're so expensive and the only way you get out of paying the higher prices for the pens are to get the ones that aren't Bluetooth capable. That to me is unacceptable. When I found that I could buy two pens for less than the price of one and they are OEM. What more could you ask for. If you buy your pens anywhere else and pay the higher prices, you're absolutely nuts. These are the real deal! I love the yellow color of the s-pen. My note 9 came with an all black s-pen and I dropped it a couple of times and it was hard to find especially in low-light situations. 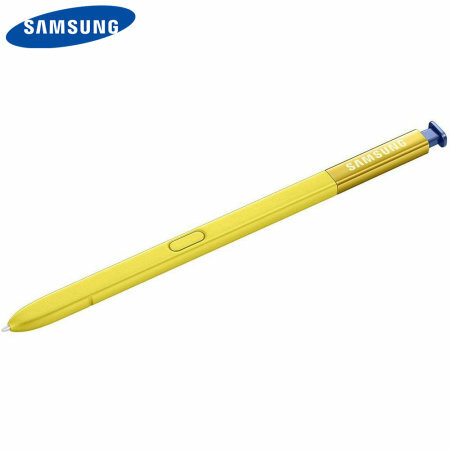 The yellow s-pen is eye-catching. It works great and I use it all the time. I was specticule at first wondering of this was that fake brand with out the bt. Was glad to see ot all works great. Highly recommend buying from here. Product was perfect and worked immediately upon receipt. We had an address issue on the order and had great communication to resolve the issue. Fantastic job from this vendor!!! The Spen is perfect! Exactly What the description said it was going to be and I paid less than 1/2 of the cost if I had gotten a new one through my phone company or straight from Samsung. Now I have a backup. I found Mobile Fun on Google after I lost my Samsung stylus for my Note S9. The pen was delivered on time and it worked as the original one that caem with the phone. The pen I ordered is as described and original with Bluetooth integrated compared to cheaper versions. Delivery was fast and the transaction was easy and smooth. I will come back for sure. great first experience. I have a very mischievous puppy, and a very mischievous one year old. My daughter( the two legged :D , not the four legged) dropped my phone and the stylus came out some time, some where. Guess what?my other mischievous daughter, yep the 4 leggedone ate it...I was forced to buy one since I did not want to pay the deductible for a new phone. Long story short I came across this page and i place my order. Couple days later it arrived at my mailbox. Original Samsung stylus. Perfect fit for my note 9. Thanks a bunch! I have a new Galaxy 9 Note - for which I lost the stylus. Now that doesn't seem like a big deal but once you start pricing them you're in for a SHOCK! It's Bluetooth enabled - and expensive too! Mobile Fun had the CORRECT item - and a price that was HALF of what Amazon asked. HALF!! That's a chunk considering it was almost $50 at the big "A". The item was on back-order for a bit but they kept me up to date and everything was delivered as promised. Glad I found Mobile Fun and I will use them again in the future. It works fine, It is a restin the fingers, and for us who like to Play with gadgets this is good fun. It was very easy and was what I needed. Arrived a couple of weeks after purchase. Worked right away, looks to be OEM. This product is then genuine factory product and works. Fully recommended. This product is a great replacement. I love it! The S Pen is exactly the one I needed for my note 9 phone. Once it charged the pen it works flawlessly and does everything the original one did. Thank you for the quick shipping time to me in Cuba. Didn't realize it would ship from outside the US... I thought I was purchasing from the us. Not a huge deal, as it did arrive, but it took a lot longer to arrive since it was from outside the country. This replacement was exactly what I needed. I was a little worried it wouldn't work seamlessly, as even the stylus for the Note 8 can't do the remote access like the Note 9s. It was affordable and got here within a reasonable time. Thanks for the great service. I have found that this item was true as advertised! That, in of itself, is a rare find in today's bullshite hyperbole misleading and just plain defrauding advertising! Kudos to you Mobile Fun. Unfortunately, I have already had to buy another one from your company because my 70 # dog thought she could pick her teeth with it! ???? At my age I'm always laying things down and then can't find them. I had done that when I ordered my S pen. I finally found the one I had lost and now I have an extra one put in a safe place. Now, let's just hope I don't forget where I put it. The service was excellent. Speedy delivery and everything went just as stated online. My dog was barking so I threw my phone big mistake broke my S Pen dog was laughing I was just about crying, got on line to mobile zap ordered another. Very happy with the price and the S Pen worked a treat now I'm all smiles. I am impressed with customer service. I will definitely buy again from this site. I love my Purple S pen ???? Bought as a spare. Does it work with the Note S9. Yes it does. Also works on Tablet S4 as a bonus. Original pen broke so I sought a replacement. Got this from the Mobile Fun site, and it's a real Samsung pen. Works perfectly. I was asked my original S pen that came with my phone. Found this website to order a new one thought it was little pricey, but my fault for losing it. Glad I found a quick easy replacement! Got my order faster than. I was expecting, considering I ordered on a Friday and I was convinced the South Africa customs were going to cause delays. Ordered Friday, got my order Sunday afternoon, very impressed and got email updates along the way. Received orig product for less than manufacturer website. Wish i had known the cheaper shipping would not be tracked. In sure it's perfect and does the job. Great device as an addition to cellphones. Unfortunately mine is stuck in the British postal system at present!!! Originally I had ordered this stylist in Gray, however upon confirmation of my order mobile fun notified me that there was a delay and their ability to ship the gray stylist and that I could change to another stylist in order to receive faster shipping. After reviewing the other stylist I found this one to be suitable and submitted my change request. The process was easy fast and intuitive, I would recommend buying products through mobile fun again to friends and family. Service is fast. Shipped and was at door step quick. If I need to I would order again .. When I originally bought this product for my wife because she lost hers. The two colors for the Violet and the Brown, look pretty similar and it was hard to differentiate the two. I called customer service after I ordered it and they helped as much as they could, but it was sent out before we can fix the situation. Customer service was very nice and friendly, then the item came in, the brown color actually isn't that bad. It works exactly as the one that came with the phone. Shipping was great really fast, I would definitely use this company again! I am very happy with this purchase, it is what it says it is in the description, it works well with the phone .I would definitely buy again from mobile fun and recommend it to my friends and family. I've never been a fan of the bus yellow S-pen on my note 9 so I wanted to find a black one. This one was great, works just like my yellow one, except looks a little better. 10/10 would recommend!! Service was good. Price excellent. Shipping time was very slow. This item works great, I have gotten it once before, and again now because I keep losing my stylus, but I'm happy I can get it here at a reasonable price. THANKS! I would have like to have known if the Verizon stores had the replacements parts. My wife lost her S Pen from her new Note 9 and looking around the web I was amazed at how expensive the replacements were! I found Mobile Fun had a fair price for the product and we were completely satisfied with the replacement! Genuine Samsung product delivered promptly. S pen is a must for note 9.. if the original gets. Misplaced or brokes then this back-up won't hurt you..